Ambika, 19 years old, is NCEP’s first alumnus! In spring 2011, she wrote the SLC (School Leaving Certificate) after months of hard preparation, and we were thrilled to recently receive her excited phone call to announce that she had passed. One year earlier, her teachers had not considered this a likely outcome. Ambika had lacked a strong foundation in several subjects due to lack of access to a good education when she was younger, and she had a large hill to climb heading into Class 10. Ambika made it clear to her teachers and the NCEP Team that she was committed to working hard to pass her SLCs, and we believed she deserved a chance. NCEP arranged a regular course of after-school tutoring for her, enabling her to fill in the gaps in her education. The results were immediate, and her teachers were amazed by her rapid progress. Now that she has completed secondary school, Ambika is setting her sights higher. She would like to become a teacher, but also has an interest in learning about computers. NCEP is keeping in regular contact with Ambika and drawing from our expanding network of partner organizations to help her reach her goals. We will keep you posted on her development. Deepak, Pawan, and Ambika in class with their teacher. 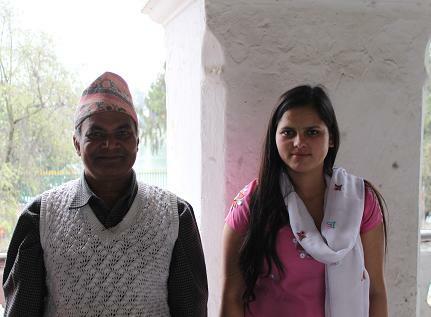 Ambika with the Headmaster of Darbar High School, Dhananjay Yadav. Ambika (right) with her sister.